Last month, my wife got approved for her Chase Ink Preferred Business card. I recently applied for and just got instantly approved for my own Chase Ink Preferred! JP Morgan Palladium – No bonus points. I applied because I wanted a card made of Palladium to add to my collection. JP Morgan Select – downgraded from my Palladium card. Chase Sapphire – downgraded from my CSP. Chase Sapphire Preferred #2 – 45K points after spending 4K and adding an authorized user. Chase Freedom Visa – 30K points after 1st purchase. Freedom MasterCard – previously converted from my Sapphire card. Chase Ink Cash – 30K points after 1st purchase. 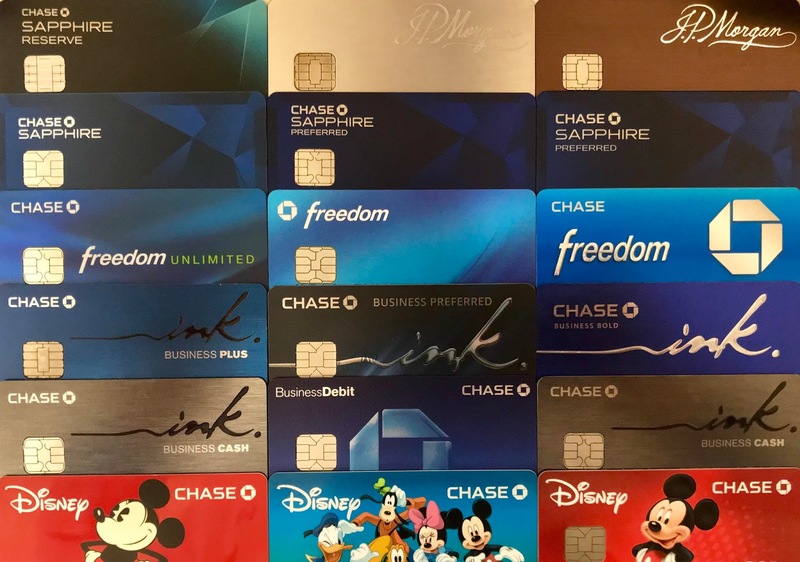 Chase Disney Debit cards – I’ve churned the Chase Checking account bonus a few times. It’s free to convert your regular Chase debit card into the Disney debit card. There are 4 fun Disney designs to choose from and the card offers some perks at Disneyland resorts. Chase Business Debit card – $300 bonus after depositing $1,000 and performing 5 qualified transactions. By far, the Chase Ultimate Rewards program is my favorite credit card points program. We’ve used our points towards free flights and hotel stays around the world. The sign up bonuses from the cards above total 465,000 Ultimate Rewards points! The Chase cards I continue to use regularly include my: Sapphire Reserve, Freedom, Freedom Unlimited, Ink Cash, and now my Ink Preferred. I’ve had a good run with Chase and will continue to utilize their Ultimate Rewards program. How many credit cards have you collected?